A while back I talked about a Potential Trap in Bond Funds which is that if prevailing interest rates go up then the market value of a bond fund will go down. This isn't exactly a secret but I don't know if its widely understood. In the past couple of years a lot of money has flowed into bond funds as people fled the scary stock market into security of fixed investments. Many of the people putting their investments into bond funds may assume their principal is safe, but they may be in for a shock. To illustrate this phenomenon I figured I'd look at the history of the price of a bond fund and compare it to the history of bond yields. I got historical data for The Bond Fund of America (ABNDX) from the American Funds website. They have the NAV price there dating back to the 1970's. Now keep in mind that this is not looking at the dividend payments from the fund, but just the market price of the fund shares. I had researched historical yield rates for AAA bonds previously so I used that data. Here is the chart showing how the change in AAA bond yields and the market value of the Bond Fund NAV change from year to year. As you can see the two generally move in opposite directions, when the blue line goes up the the pink lines goes down and vice versa. As bond yields go up the market value of the bond fund goes down. 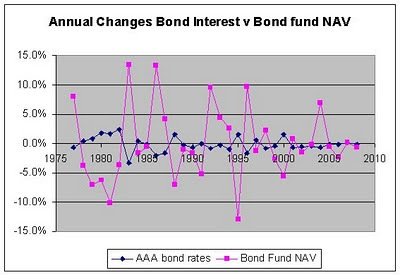 Looking at a specific year, in 1999 AAA bonds yielded 6.2% average. Then in 2000 the rates went up to 7.8%. The Bond fund was selling for 13.65 in 1999 and then went down to 12.90 in 2000. You might notice that the market value of the bond fund goes up or down a bit more even when bond interest rates don't change drastically. I'm not certain of the cause for that but I might guess that it is due to other market conditions causing bond fund values to change.